PT790Ex - The World’s First Intrinsically Safe Radio Of The Highest Explosion-proof Standard. Hytera’s PT790EX ATEX is a M1 Intrinsic Safety (IS) is a protection technique for safe operation of electrical equipment in hazardous areas. It is realized by limiting the energy available for ignition. ia is the most strict explosion-proof standard of Intrinsic Safety, which allows PT790 Ex to work in various kinds of hazardous and harsh places, even those containing explosive mixed gas and dust. In mining industry, methane and mine powder is the main risk. PT790Ex can achieve M1 protection level, which ensures security in mining environment. 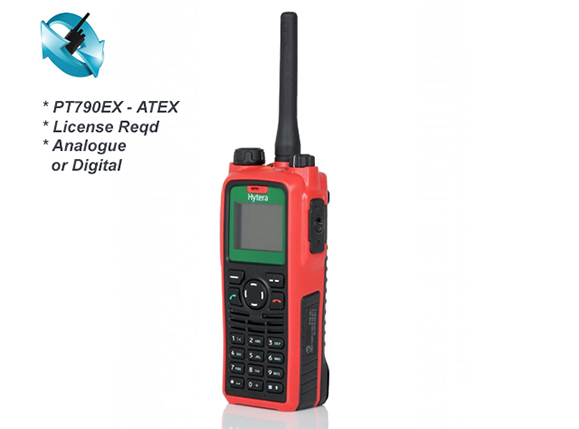 Check below for full information of the PT790EX ATEX radios, all accessories and any reviews that have been entered. Lastly, fill out the contact form for the best UK pricing. Check our price promise as pricing matters! Intrinsic Safety (IS) is a protection technique for safe operation of electrical equipment in hazardous areas. Whether on an oil rig, in a coal-mine, a gas station or any other potentially explosive environments, safe and reliable communications are on top of everything. Hytera deeply understands the challenges for our users in hazardous and harsh environments. In order to meet the increasing requirements for intrinsically safety and reliable communication, Hytera brings you PT790 Ex, the first ia explosion-proof TETRA radio in the world. Hytera PT790Ex, TETRA Intrinsically Safe Portable, is designed to comply with the highest grade "ia." PT790Ex works in places which contains a variety of explosive gas, even mine methane, for example, coal mine, gas stations, oil platforms, chemical plants, flour mills, airport and other inflammable or explosive conditions, etc. Separated by the antenna, channel knob and volume knob stand apart from each other. The design of their different sizes enhances the accuracy of operation, and greatly reduces incorrect operation with gloves or in dark environment. PT790EX's compact and large textured keys provide an excellent tactile feeling. Innovative Ergonomic Design: Hytera PT790Ex provides 1.8-Inch, 65536-color, LCD screen, which can be clearly displayed under bright sunlight. As many as 20 programmable keys are flexibly configurable for quick access through one button operation. Friendly User Interface: Hytera PT790EX provides 1800mAh/2400mAh large capacity Li-ion battery, which can last for more than 20 hours under 5-5-90 duty cycle. Strict overcharge and overdischarge protection design ensure the battery against instability caused by overheating. In addition, the battery cells are also encapsulated to redistribute single point heat buildup and prevent air discharge as well. PT790Ex has a globally patented industrial design with an antenna in the middle position, providing omnidirectional antenna pattern for better signal coverage. The antenna used in PT790Ex is a patented design which is short in length and having GPS integrated.